With the Olympics about to close I’m already anticipating the gap its going to leave in my life. Normally I hardly ever watch sport, but for the last 2 weeks I have been glued to the television enjoying seeing the best of the world’s sportsmen and women compete and, like most of us, have taken huge pride in seeing how well Team GB have done. 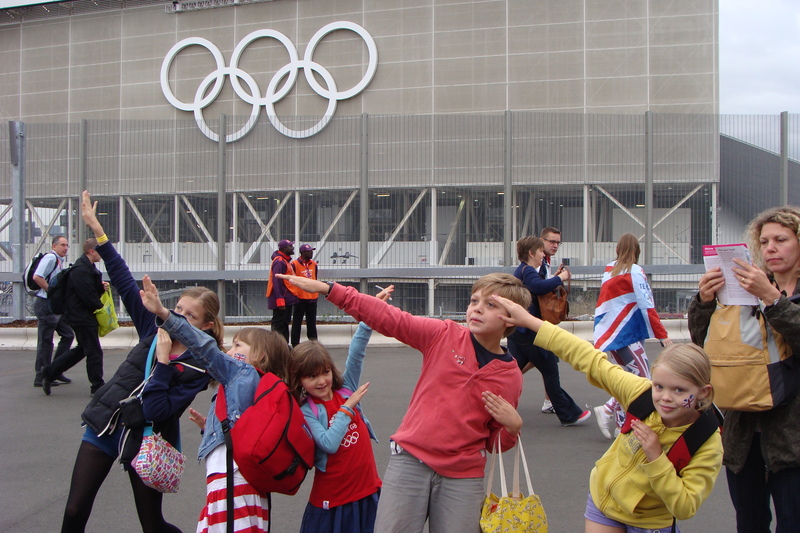 We’ve even been lucky enough to visit to the Olympic park after securing some tickets for the track cycling. (We saw Chris Hoy and Laura Trott compete in their first rounds for events they eventually won – I can honestly say it was the most exciting thing I have ever spectated!) All of this has left me examining my difficult relationship with sport. Most of my family did well in sport, but I was the exception, proving fairly mediocre in most things I tried. I showed early promise in swimming but when it came to secondary school and having to train regularly to stay in the team, I didn’t have the committment. I quite enjoyed games, but not being gifted at hockey, tennis or netball, lessons soon became a became more endurance than enjoyment and like many teenage girls I went off participating in sport, and wasn’t above making up excuses to get out of PE. Then some enlightened teacher invited a few of us to go rock climbing and suddenly I realised you don’t have to compete against other people to enjoy the thrill of and stretching your body and mind and that outdoor pursuits can be a real buzz. This opened the door to canoeing and mountain biking and these days I most enjoy hiking and wild swimming as a means to get the blood pumping and clear my mind of any stress and pressure that builds up indoors. The much publicised London 2012 goal is to ‘inspire a generation’ and I am completely behind that idea but hope that within the drive to get children participating in sport we do not lose sight of the bigger goal; to get everyone actively enjoying physical exercise as a healthy habit for life. Not everyone can make it as the next Mo Farrah and Jessica Ennis but they shouldn’t be put off being active if they don’t have the talent to make the team. An hour in a gym would bore me to tears but I’ll walk up mountains all day for the pleasure of it. Likewise children who claim to not enjoy PE at school, run, climb and scramble around the woods for hours at forest school without even realising they’re exercising. Competition is important; I doubt our gold medalists were inspired by the non-competitive school sports days where ‘everyone’s a winner’ but nor should any child be trying to bunk off school for their dread of coming last, as a friend of mine recently reported about her daughter who I know to be a highly adventurous and able outdoor girl. Helping children to turn their natural instincts for active outdoor play into regular enjoyable activity as they become teenagers and lifelong lifestyle habits as adults should be our ultimate goal. Yorkshire athletes did really well at the Olympics (we’d have come 11th in the medal table if we were a country!) and I’m sure our wonderful landscape has had a hand in motivating them to run, swim and cycle to greatness. The Olympics has inspired me to encourage more sedentary adults to join me in getting off the sofa and enjoy being active outdoors, rather than the face the embaressment of lyrca or the tedium of exercise machines at the gym. But right now I’m off to settle down on that sofa and watch the closing ceremony. Well done Team GB!